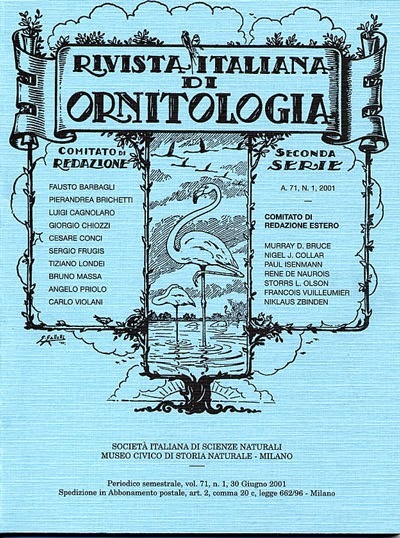 The Italian Journal of Ornithology (Rivista Italiana di Ornitologia) is a very old italian journal: it was founded in 1911! Now it was re-styled, there is an English name with the same acronym (Research In Ornithology), a new journal cover and a new Editorial Board led by the prof. Giuseppe Bogliani. We invite all the researchers to take a look to the new website and to submit to the journal their papers. Click on the picture below to enter the RIO website. Between the 11th of August and the end of September we observed the passage of raptors together with our friends of Ornis Italica on the Aspromonte mountain. From a single watchpoint we counted 11484 raptors moving southward. 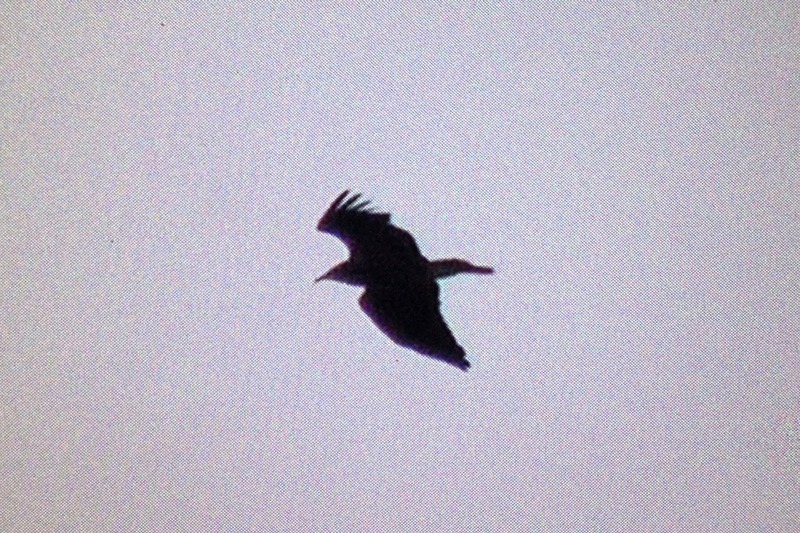 Among them several Honey Buzzards, Black Kites and Marsh Harriers. 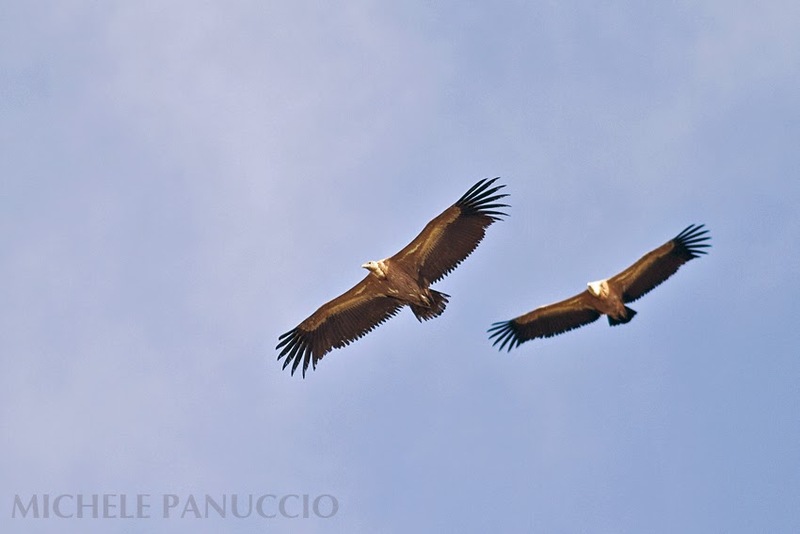 Among the rare species we underline the passage of four individuals of Egyptian vultures with two fresh juveniles. Unfortunately some poaching activity was recorded during raining days when raptors flew at lower altitudes on the ground. Steppe buzzards are not always easy to distinguish from individuals of the nominal subspecies. Also because of the large overlap area in Eastern Europe where several birds show intermediate characters between the two subspecies. 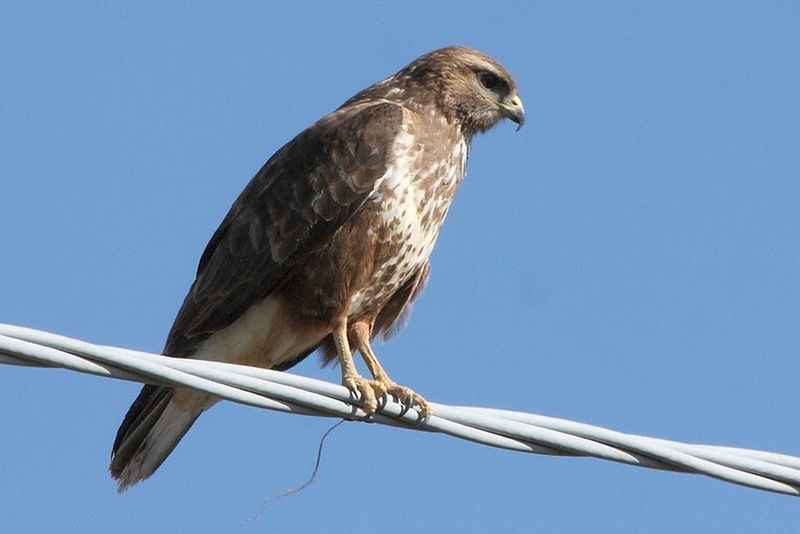 Therefore, here in the Central Mediterranean area, it's a kind of satisfaction when you catch the sight of a buzzard that clearly is a vulpinus. 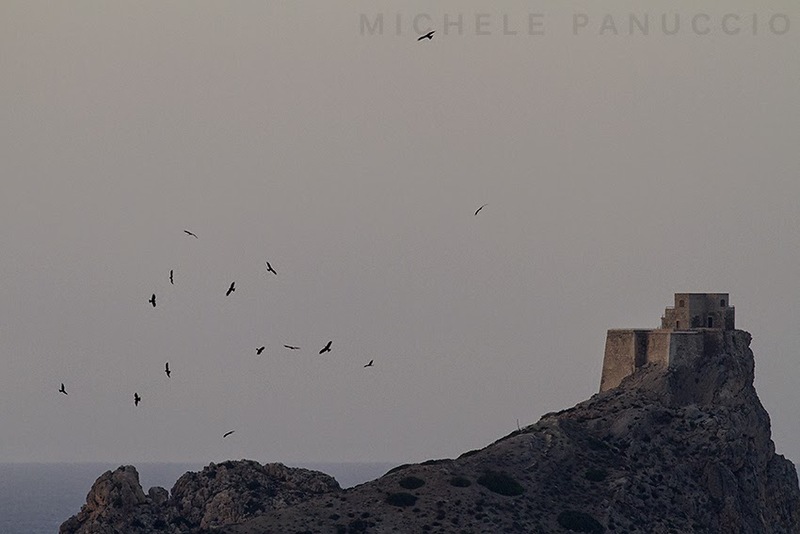 In the picture below a shot of an individual migrating at the island of Marettimo (Western Sicily). It is possible to identify it thanks to the distinct trailing edge, the fine barring remiges and the subterminal tail-band typical of adult individuals. 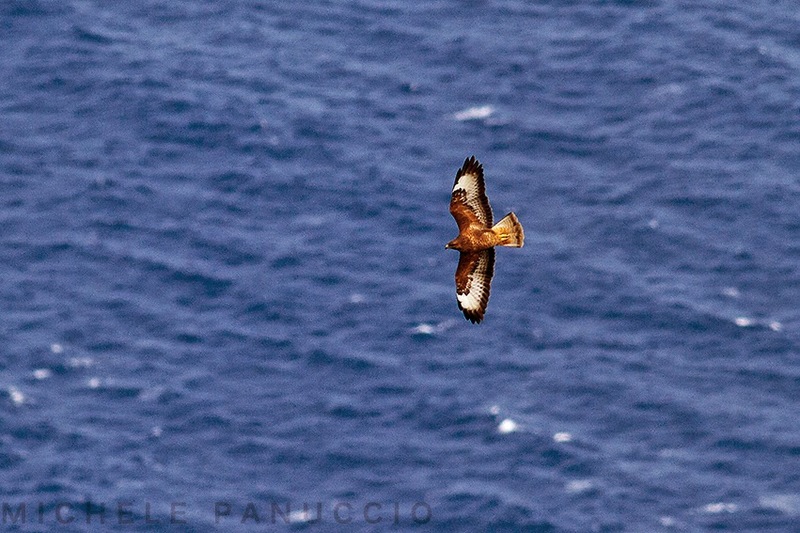 Despite the very strong southern wind some raptors are reaching the island of Marettimo. 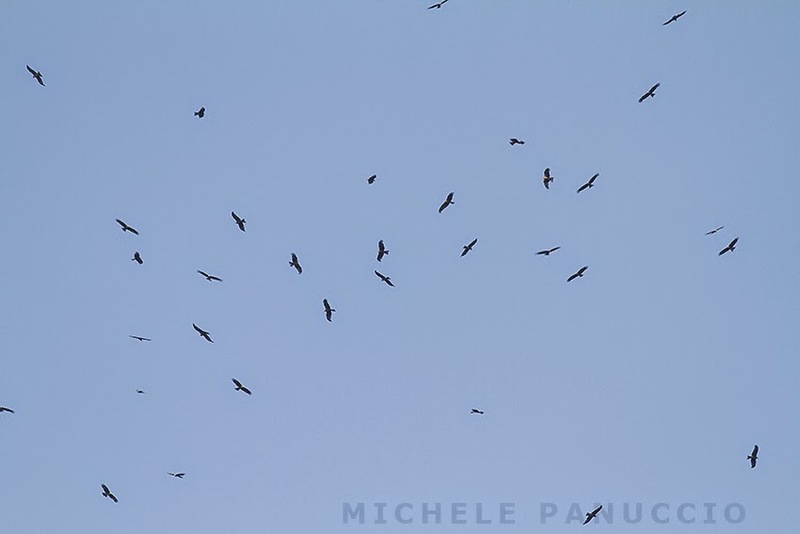 Yesterday a flock of about 100 Black Kites has been observed. Moreover Short-toed Eagles, Marsh Harriers, Common and Steppe Buzzards are hunting along the ridge of the main relief waiting for a changing wind. Yesterday a large flock of Cranes has been detected by radar flying over the Aspromonte mountain and we have counted about 200 cranes heading south. 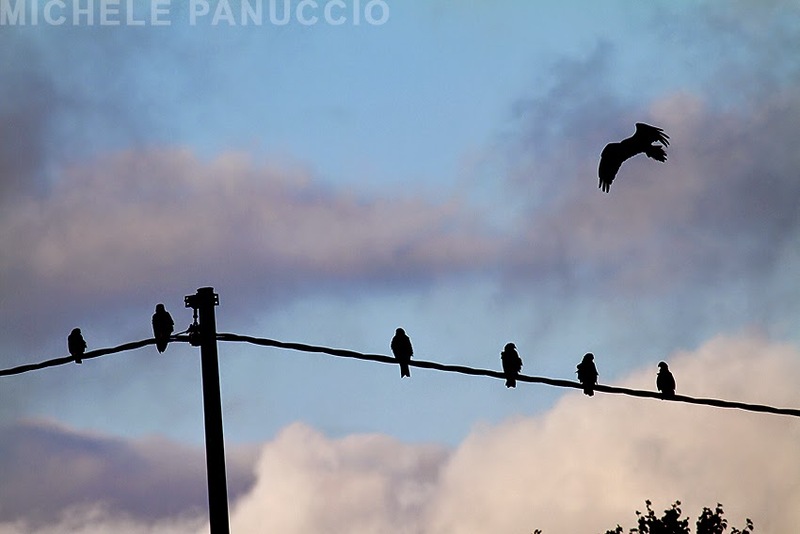 In the picture below (by Giovanni Cumbo) a record shot of this amazing flock. Moreover raptors are still moving across the study area and the most common species are Marsh Harriers, Lesser Kestrels and juvenile Honey Buzzards. After 6 days of fog and rain in the end yesterday there was a great sight over the Aspromonte mountain. Here below the Egyptian Vulture observed yesterday flying over our watchpoint. The picture was taken by Jack Ashton-Booth. Today hundreds of raptors were observed moving over the Aspromonte under intermittant light rain showers. 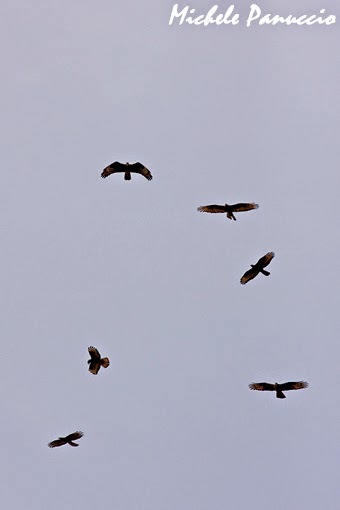 Some Honey Buzzards were forced to ground and had to endure the worst of the weather before continuing on their migration (see the pictures attached). Their migration speed was much slower and resulted in several parties of birds deciding to roost at the site before nightfall, as was the case for a flock of Black Kites pictured below and of the Honey Buzzard in the amazing picture taken by Jack Ashton-Booth. APPLY NOW – FULL FUNDING AVAILABLE TO WINNING APPLICANTS – DEADLINE: Monday 28 JULY 2014! To discuss about what it was done and about future projects and to meet together we invite all our friends and colleagues to come at the Medraptors meeting the next September on the Aspromonte mountain (Southern Italy). The meeting will be held in Gambarie d'Aspromonte (Reggio Calabria) on the 19th, the 20th and the 21st of September 2014. 20th observations on raptor migration. 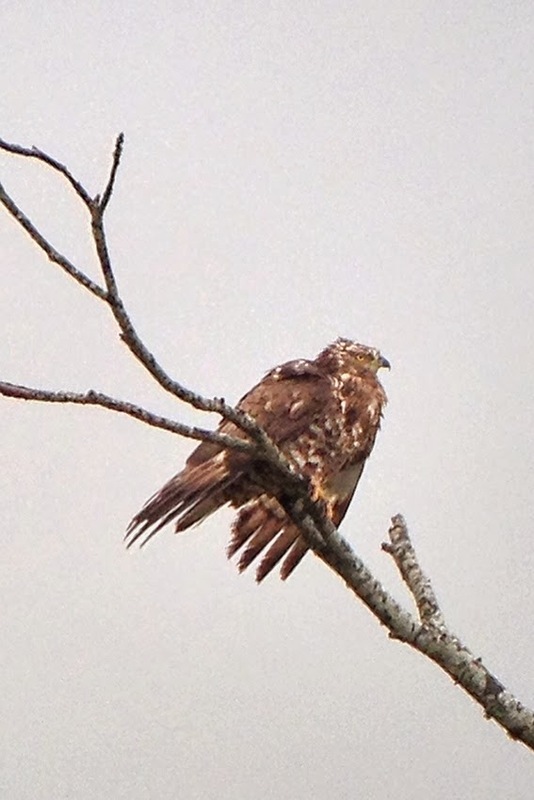 In this period the passage of Marsh Harriers and juvenile Honey Buzzards occurs. In the evening we'll have dinner in a typical restaurant and we'll have the chance to discuss together. Gambarie is a small village located at about 1350 metres a.s.l. inside the Aspromonte National Park. The area is covered by forests of beech and silver fir. The area is the most important bottleneck for the autumn migration of raptors in the Central Mediterranean area and last year 30.000 raptors heading south were counted. It is possible to reach Gambarie with a bus from Reggio Calabria where there is both the train station and the airport. 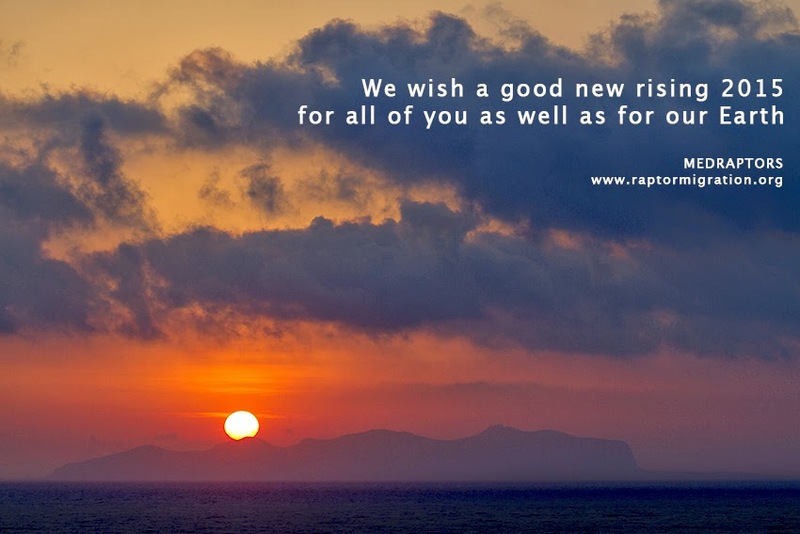 The breeding season is closed in the end (more or less) for the European raptors and in the next weeks they will start again to move across the Central Mediterranean area. Therefore we are close to start a new fieldwork on the Aspromonte mountain together with our colleagues of Ornis Italica. In that area last year were counted about 30000 thousand raptors, mostly Honey Buzzards, Black Kites and Marsh Harriers. 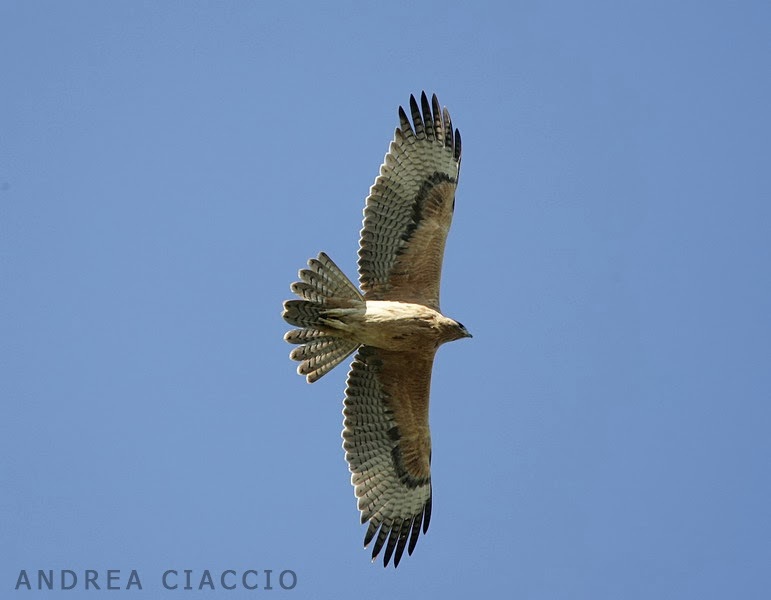 Raptors migrate following the ridge of the Apennines heading toward Sicily and flying over the forest and the plain of the Aspromonte before crossing the Strait of Messina. For further information about the project contact us. 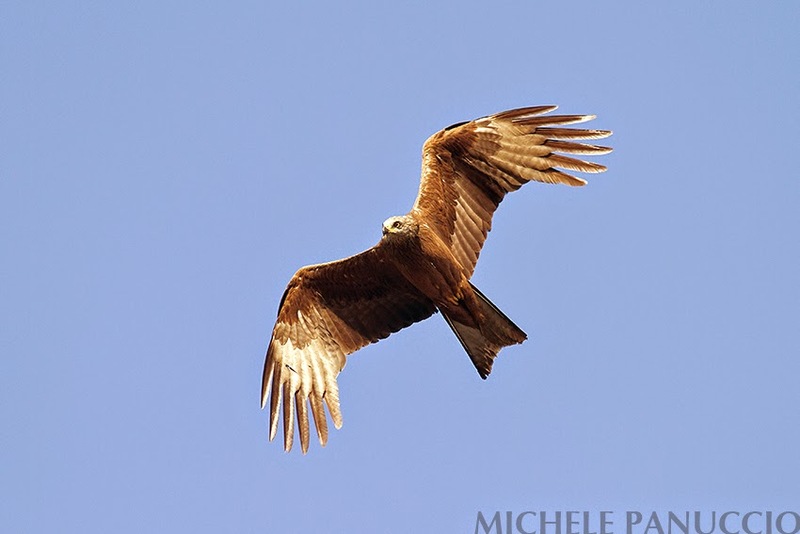 In Central Italy chicks of the Black Kite are close to fledgling. Here in the picture below an adult individual feeding the youngs in its nest. The picture was taken yestarday morning in the Natural Reserve of Decima Malafede close to Rome. 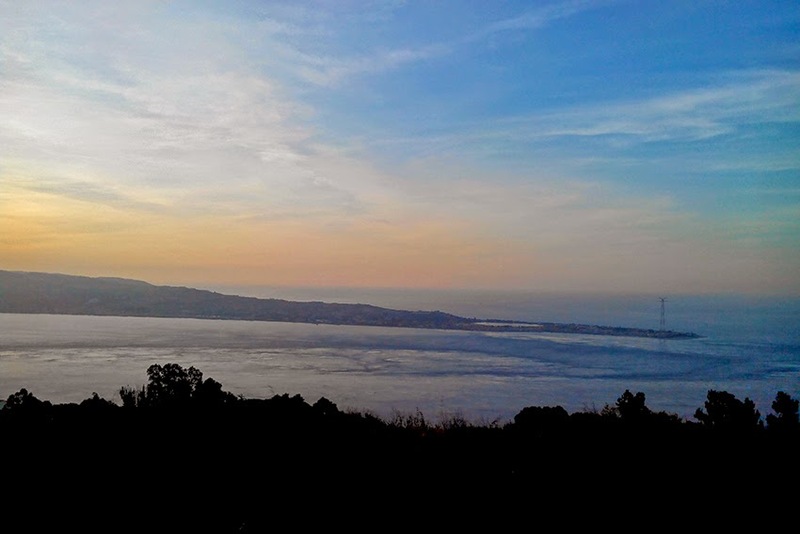 After a long time a new post to report the results of the observations that we carried out last spring on the continental side of the Strait of Messina. We counted 16705 individuals and 15 species of raptors from a single watchpoint between the 8th of April and the 20th of May. As expected most of them were Honey Buzzards. Next appointment in August when there will be held the new fieldwork together with our friends of Ornis Italica. A first heavy passage of Honey Buzzards was recorded yesterday at the Strait of Messina after some days of rain, fog and clouds. 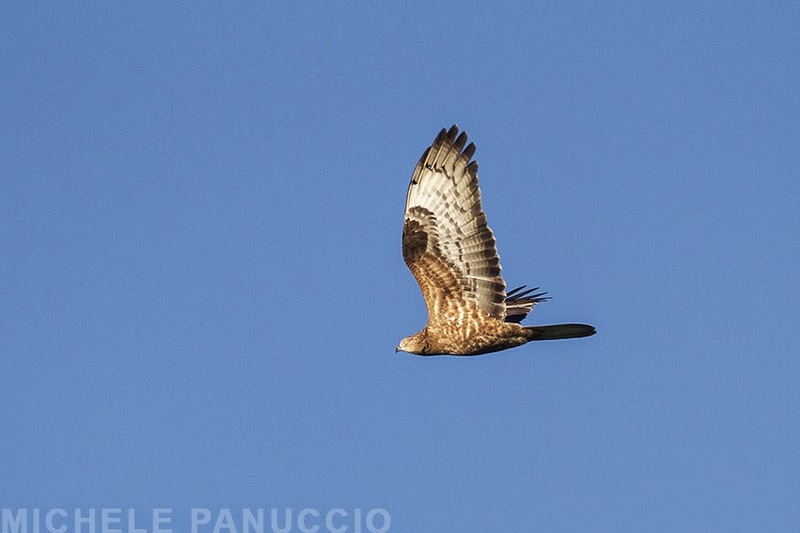 On the anniversary of the Liberation from fascism in Italy, several hundreds of Honey Buzzards have been observed moving toward north along the valleys of the Aspromonte mountain. Together with them many Marsh Harriers, Montagu's Harriers and some Booted Eagles, Hobbys and Kestrels. Unfortunately many individuals were shot by poachers in the evening when raptors went to roost and passed low over the houses of the Calabrian villages. This was possible because of the lack of control by the Forestry rangers who have not yet started the anti-poaching operations. 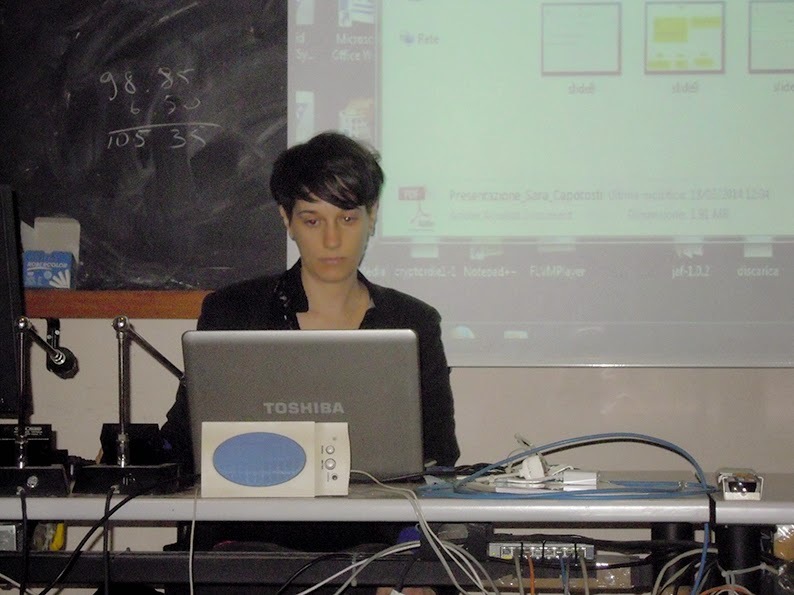 Some days ago Sara Capotosti discussed her thesis in Informatics at the University La Sapienza of Rome. She developed a web portal in order to support the research related to raptor movements and their dissemination basing on MEDRAPTORS activity. 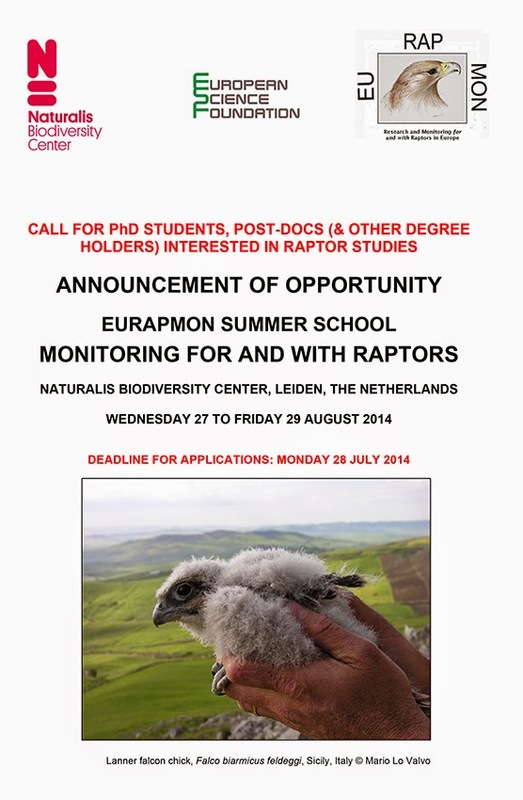 The title of the thesis is: "RaptorMigration a web portal for the study and the observations of migrating raptors". 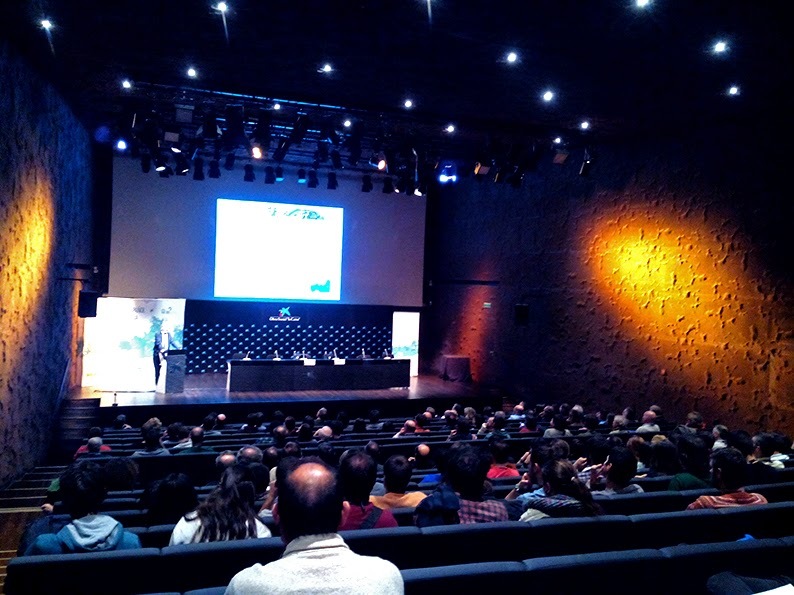 We congratulate with her and we hope to launch a new MEDRAPTORS website realized thanks to her thesis next summer. We started a new project together with the association Ornis Italica in order to investigate the migration of raptors at the Strait of Messina. 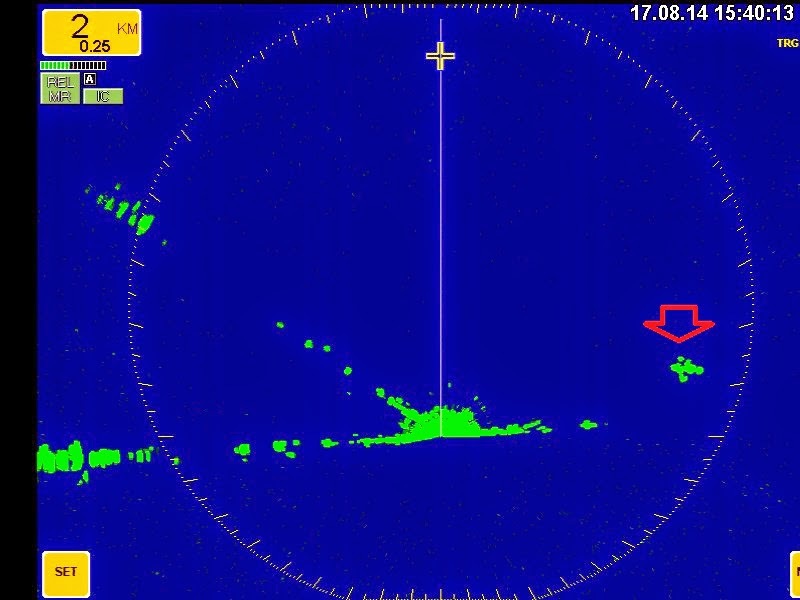 The aim of this research is to collect data on the flight behaviour of migrating raptors. The fieldwork started at the beginning of April and will go on until the 20th of May. Also the autumn migration will be monitored between the 10th of August and the end of September. 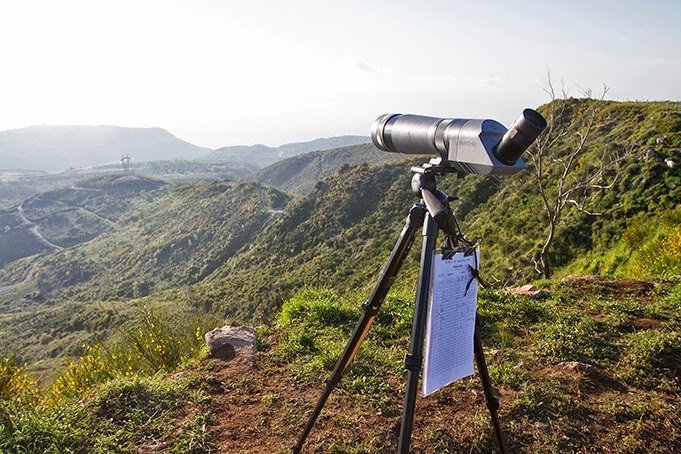 Up to now we monitored the passage of Marsh Harriers and Montagu's Harriers moving along the slope of the Aspromonte mountain on the continental side of the Strait. If you are interested in this project write to us. 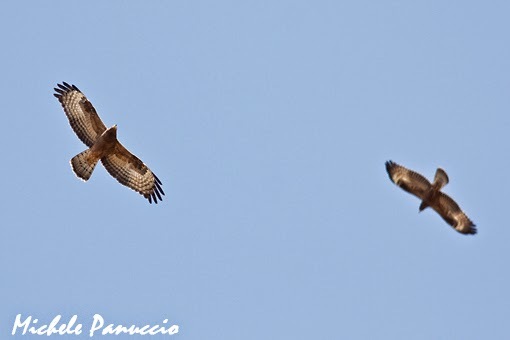 At the Strait of Messina relevant numbers of Marsh Harriers are still moving toward North. Yesterday dozens of individuals have crossed the Strait together with Lesser Kestrels, Pallid Harriers and few individuals of some other species such as the Booted Eagle and the Hen Harrier. 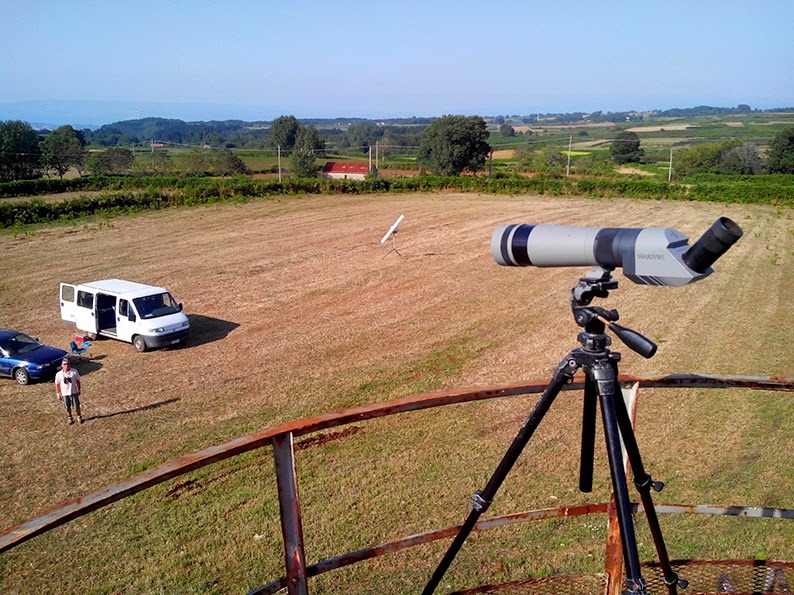 After ten years of the "Migrating Raptor Project" led by LIPU (BirdLife Italy), on which we collaborated during the fieldwork, now there are substantial news. First we are analyzing the data collected during the past years in relation to dominant wind patterns with the collaboration of Jost Von Hardenberg from the Institute of Atmospheric Sciences and Climate of Tourin (CNR). 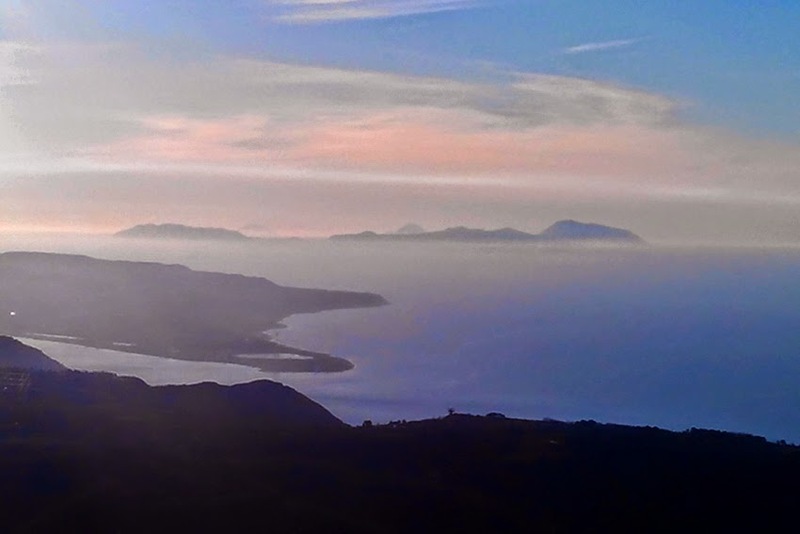 Moreover a new fieldwork has been started with two main aims: the first is to collect systematic data on the early phase of migration over the central Mediterranean using three different areas: the Strait of Messina and the islands of Panarea and Ustica. 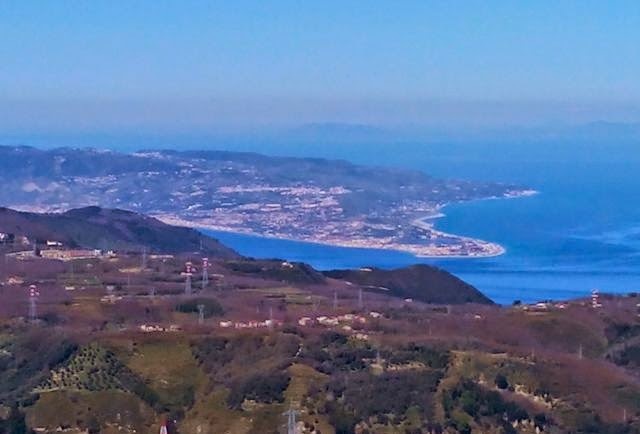 The second project aims to investigate for the first time the migration at the Strait of Messina using simultaneusly two watchpoints along the ridge of the Peloritani mountains. 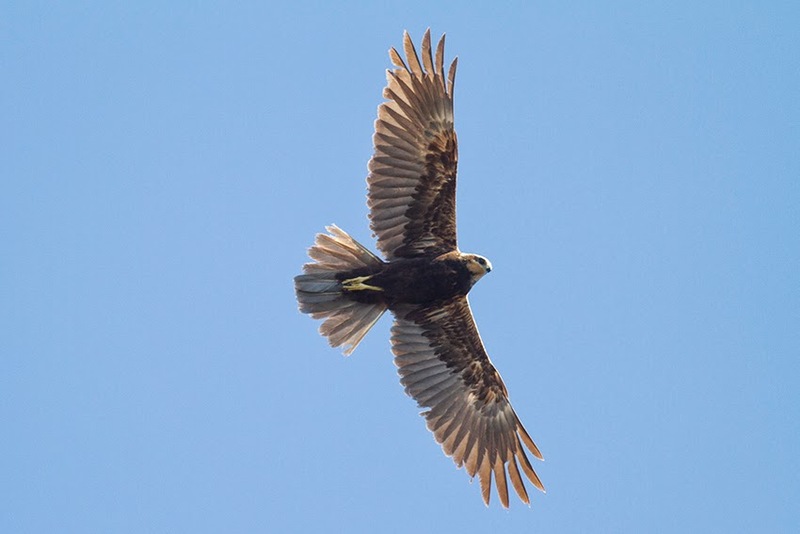 Observations started on the 10th of March and up to now more than two thousand Marsh Harriers together with hundreds of Black Kites and other raptors have been observed. We are enthusiastic with this new projects as well to reinforce our collaboration with LIPU (BirdLife Italy). 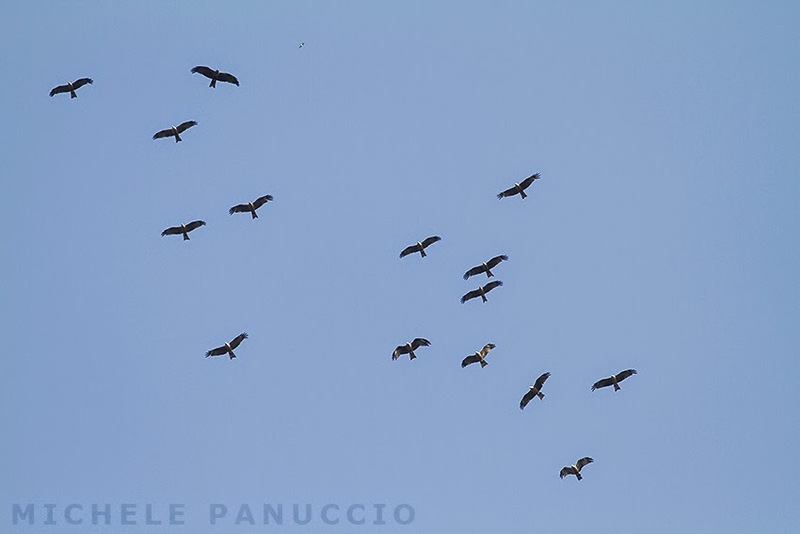 As usual the first species showing mass movements through Italy in spring is the Common Buzzard. 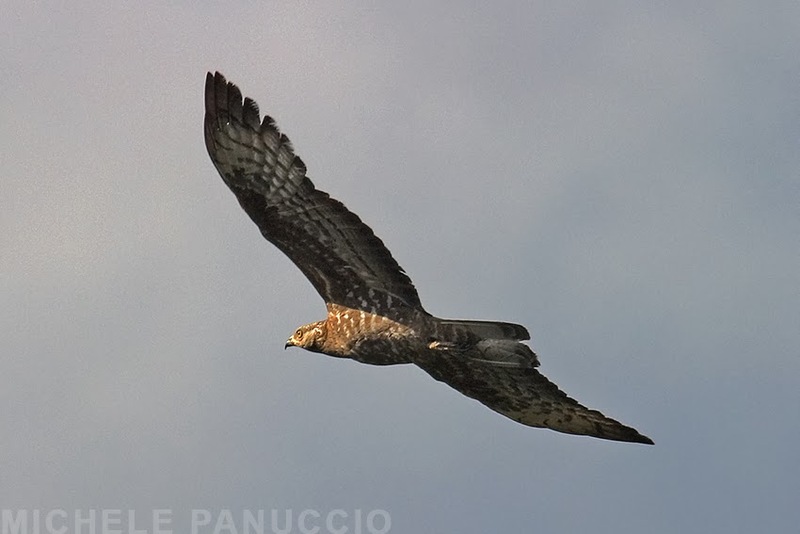 In these days the passage of hundreds of buzzards is reported in many sites of the Italian peninsula in particolar in Northern Italy along the alpine valleys. New paper on raptor migration in Greece out now! The results of a research on raptor migration in northeastern Greece has been published on the Journal of Natural History. 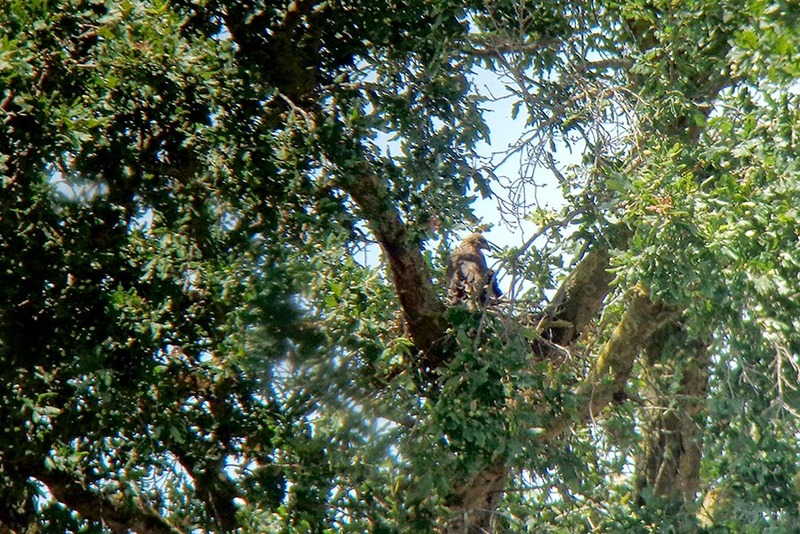 Data were collected in one of the most important sites for raptors of Southern Europe: Dadia National Park close to the border with Turkey along the valley of Evros river. Lots of research has been carried on there already on the local community of birds of prey, but this is the first migration paper. It reports interesting information on numbers and proportions of species, on species migration phenology, on local migration hotspots and on the movements of birds of prey through this area discussing the results also in relation to Medraptors research. What is peculiar is that the paper deals with spring migration, which is not well covered in litearture compared with the research about autumn migration. To read it click on the link below. Schindler S., Poirazidis K., Ruiz C., Scandolara C., Cárcamo B., Eastham C. & Catsadorakis G. 2014. At the crossroads from Asia to Europe: spring migration of raptors and black storks in Dadia National Park (Greece). Journal of Natural History dx.doi.org/10.1080/00222933.2013.836760. Panuccio M., Agostini N., Mellone U., Lucia G., Booth J.A., Wilson S., Chiatante G. & Todisco S. 2012. Le Serre Catanzaresi: Important Bird Area (IBA) per la migrazione autunnale dei rapaci. In: Benussi E. & Perco F. (eds). Atti del XIV Convegno Italiano di Ornitologia. 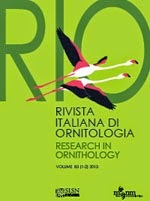 Rivista Italiana di Ornitologia 82: 239-241. Mellone U., Agostini N., Panuccio M. & Gustin M. 2012. La migrazione primaverile dei rapaci Accipitriformi attraverso le isole Eolie: primi dati. In: Benussi E. & Perco F. (eds). Atti del XIV Convegno Italiano di Ornitologia. Rivista Italiana di Ornitologia 82: 235-237.